Nurudeen Abdul Ganiyu, a 32-year-old renowned mobile money fraudster who succeeded in duping several persons including the Former Upper West Regional Chairman of the New Patriotic Party (NPP), Alhaji Abdul-Rahman Abubakari affectionately called Alhaji Short has been jailed 10 years in a Wa Circuit court. The convict was arrested in October and had in his possession over 30 registered SIM cards which he registered with different names using falsified National Identity Cards. He succeeded in duping more than 50 people according to the Wa Police. Proceeds of his nefarious activities spanning two-years have been channeled into the construction of a three-bedroom apartment located at the Driver Vehicle Licensing Authority (DVLA) offices, one of the prime areas within the Wa Municipality. He said the 3 bedroom house is at lintel level. The court has ordered the confiscation of the property to the state. He was convicted on his own plea of guilt. Nurudeen Abdul Ganiu upon his arrest showed no signs of remorse while giving details of his modus operandi to the police. “When you mention the name or the number, they will register the cards for you.” he confessed. He also claimed to be working for Wa-based Angel FM and has been filing reports for them. 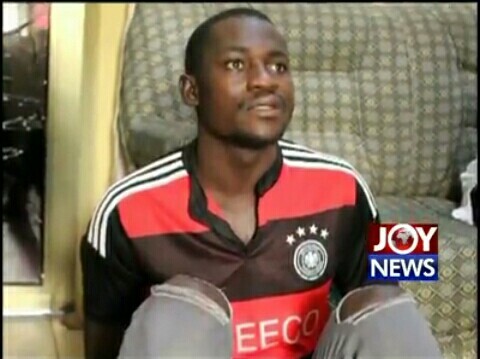 He bragged about how he acquired the identities of his victims and managed to dupe them over 150,000 cedis using over 40 mobile phones.” Upon his arrest, Alhaji Short, one of his victims expressed shock over the incident and said he had once helped the criminal pay his school fees. The Deputy Upper West Regional police commander, ACP Peter A. Ndekugri said they nabbed him in Tamale where he was hiding. So far 13 people have emerged to identify him as the person who defrauded. Senior State Attorney, Saeed Abdul Shakur said there is more to come as the state is seeking 100 years jail for the convict based on his other crimes.